Female-focused Danish retailer Naked return to the arms of ASICS for the third time, this time taking to the track to present a footwear duo and accompanying fitness apparel capsule. 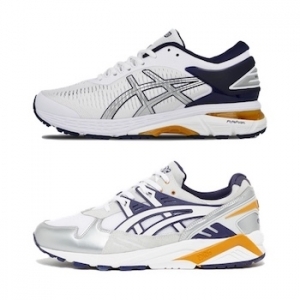 Working with the ASICS GEL-KAYANO and ASICS GEL-KAYANO 25, the pack presents two fresh takes on the silhouette in a fresh white mesh and leather construction, featuring scatterings of navy, gold, and silver accents. The fitness apparel boasts a running jacket, sports bra, t-shirt, leggings and gym bag in a corresponding navy and gold palette, which is finessed with reflective branded hits.